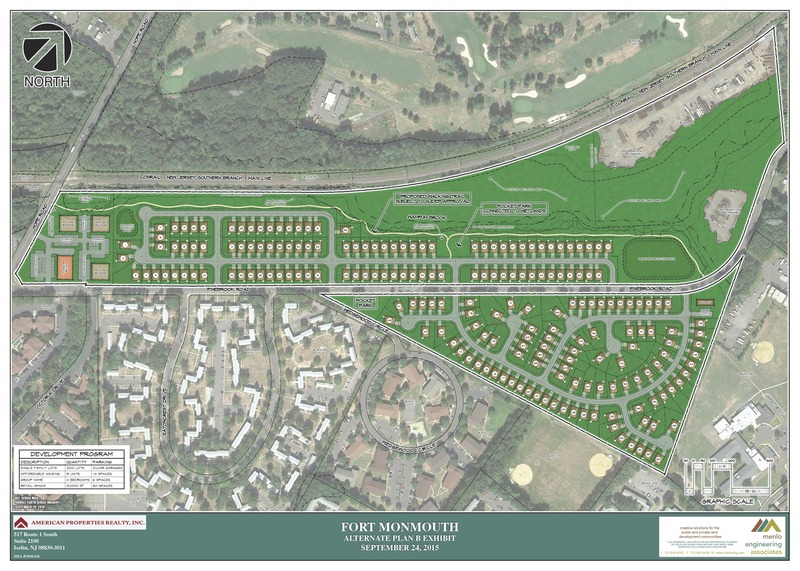 With plans to bring additional housing and retail/commercial opportunities to the area, the Fort Monmouth Economic Revitalization Authority (FMERA) Board this month authorized staff to enter into a Purchase & Sale and Redevelopment Agreement (PSARA) with American Properties at Monmouth, LLC. for the sale of Howard Commons. The 63.367-acre parcel is located on Pinebrook Road in the Fort’s Charles Wood Area in Eatontown. American Properties has proposed up to approximately 15,000 square feet of retail/commercial space on the parcel, in conjunction with 251 residential units. Two-hundred of these units will be owner-occupied single family detached residences and the remainder will be affordable housing units (for sale or for rent). In addition to the construction jobs associated with the project, American Properties has indicated plans to create a total of up to 28 permanent jobs at the property within five years. Pursuant to the Fort Monmouth Reuse and Redevelopment Plan, 486 existing and outdated townhouse units constructed by the Army on the parcel in 1953 will be demolished to make room for these new units, as well as the demolition of a general-purpose building located on the property. Iselin-based American Property Realty, Inc., the parent company of American Properties, and its affiliates have developed over 12,000 homes, ranging from luxury single family estates to master planned communities of apartments, condominiums, town homes and single family homes to mixed-used development and redevelopment projects including office, retail, hotel and residential uses.